One more update in the form of a Windows binary compiled from the latest Git source code of the ccMiner 1.5.76-git SP-MOD fork by SP optimized for the latest Maxwell-based video cards (source). The new release 76 marks is focused on optimizing the performance for CUDA 7.5, the last CUDA 6.5 compiled release was version 74. 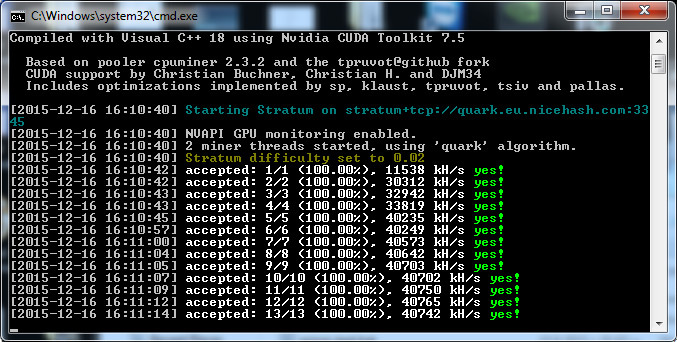 The performance improvements since release 75 are mostly focused on the X-algorithms, though you should see some improvement in Qubit and Quark as well, Neoscrypt on the other hand is still significantly slower on the CUDA 7.5 releases. Do note that the SP-MOD fork of ccMiner is designed for Nvidia Maxwell GPUs such as the already available GTX 750, 750 Ti as well as the newer GTX 960, GTX 970, GTX 980 and GTX 980 Ti and GTX Titan X. The Windows binary release we have made available here is with support for Compute 5.0 and Compute 5.2 GPUs or with other words only for Maxwell-based Nvidia video cards compiled with CUDA 7.5 and VS2013.